Starting today, June 26, 2017 and lasting through June 30th, Cricket Wireless will be offering its customers a new reward each day. 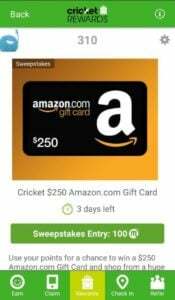 Subscribers to the free rewards program will have the opportunity to get 50% off Cricket Wireless refill cards, receive gift cards from major retailers and enter sweepstakes to win prizes such as a brand new Samsung Galaxy S8. One grand prize winner will receive two tickets to fly to and see an artist at a participating House Of Blues Entertainment venue. If you're not already a Cricket Wireless rewards member, Cricket Wireless will give you 10,000 points just for signing up which can be instantly redeemed for a $5 gift card among other prizes. Subscribers can choose to pass on the gift card in favor of a 3 months subscription to the WWE network which will only cost them 500 points. Those who have not yet enrolled in auto pay billing would receive 1,000 points for doing so. Adding a second line of service would get you 10,000 points. Cricket Wireless will also reward you 200 points just for watching their Cricket rewards tutorial, and you can receive another 1,000 by paying your bill at your local Cricket store. Other simple ways to earn points are by playing Cricket branded games, completing challenges, checking into the rewards app, and by visiting select locations near you. Cricket Wireless also says those that are not customers can participate in the rewards program as well, although subscribers to the network will reap the most benefits. I downloaded the app to check it out myself and was able to instantly get 310 rewards points even though I am not a Cricket Wireless customer. I traded in the points for 3 chances to win a $250 Amazon gift card. To find out more about the program head on over to Cricket Wireless or download the app. If you are considering a switch over to Cricket Wireless, Amazon currently has Cricket SIM cards on sale for $0.99 which is $9 off the regular price of $9.99.